Lemon Mint Orzo Salad - super easy, super fresh! 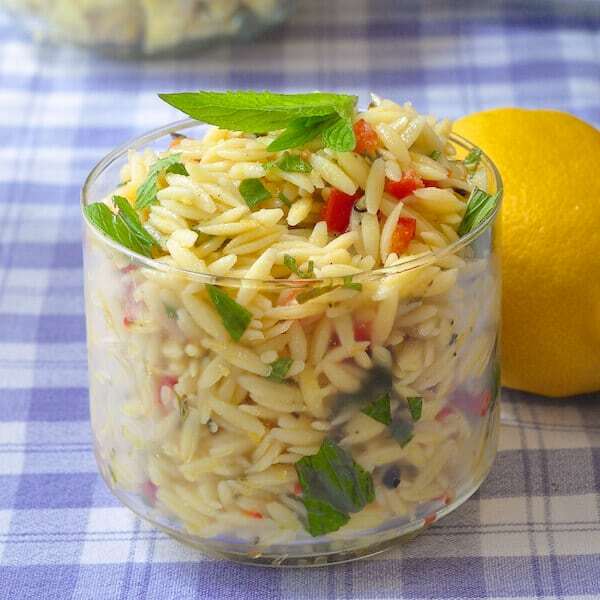 Lemon Mint Orzo Salad. A super easy, super fresh pasta salad that makes a delicious barbecue side dish or an accompaniment to leftover cold cuts for lunch! At summer’s end there’s still plenty of fresh mint in the small herb garden steps from my back door. I keep it contained in a planter box so that it doesn’t go everywhere in the garden. It is one of the hardiest and fastest growing herbs you can cultivate. Seeing the first buds of mint in the spring and pinching the tiny leaves to release their scent is one of those things that’s always a harbinger of summer for me. I like to add a few chopped leaves to mixed salads for a burst of fresh flavour. It’s terrific to have on hand for garnishing desserts or to muddle into cocktails like mint juleps and mojitos. With great grilling days still to come through the fall, we served this as one of the side dishes with BBQ pork chops when friends came over for dinner. It has such simple complimentary flavours and is super quick and easy to make. I do like to make it just before serving, because although it will be fine for a day or two in the fridge, the bright colour of the mint will fade a little as it wilts. I love this as an orzo salad using those little rice shaped pieces of pasta but really, practically any pasta could be substituted. Rigatoni, fuscilli, or even plain old macaroni would be just fine in this recipe. Like this Lemon Mint Orzo Salad recipe? Lemon Mint Orzo Salad - a super easy, super fresh summer pasta salad, that makes a delicious barbecue side dish! Cook the pasta in salted water until tender but not mushy. Drain and rinse with cold water. Let stand for 10 minutes to drain completely. Add the pasta to a bowl along with the diced red pepper. To make the dressing whisk together the lemon juice, lemon zest, mint, olive oil, honey, salt and pepper. Pour the dressing over the pasta and peppers and toss together well. Refrigerate for an hour before serving, tossing the pasta salad at least a couple of times during the chilling time. Light, yet full of flavor and delicious! It’s become a staple for family bbq sides. Even my mom, who could rival toddlers for pickiest eater, loved it AND HAD SECONDS!! Thank you for that!